Note from the artist: This house was hand made by myself (T Wells) and my nephew (B Wells) who is working toward becoming an Eagle Scout. 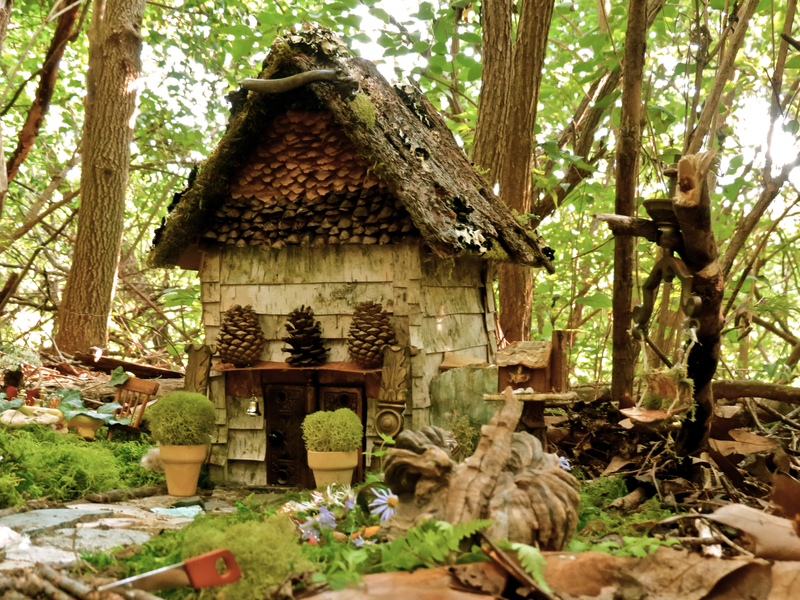 We crafted the house from scratch, collecting birch bark, pine bark, moss, and pine cones. We picked up some unique fixtures from a local reuse store (drawer handles, antique door hinges) The walk way was made from cut and polished stones (I have a rock hound – and core member of the Che-Hanna Rock and Mineral Club – in the family). The swing was made from scratch by my nephew. The little bird house and trinkets in the diorama weren’t made by us (everything else was). Those items were all found in a box of ‘doo-dads’ that had taken up residence in my attic. 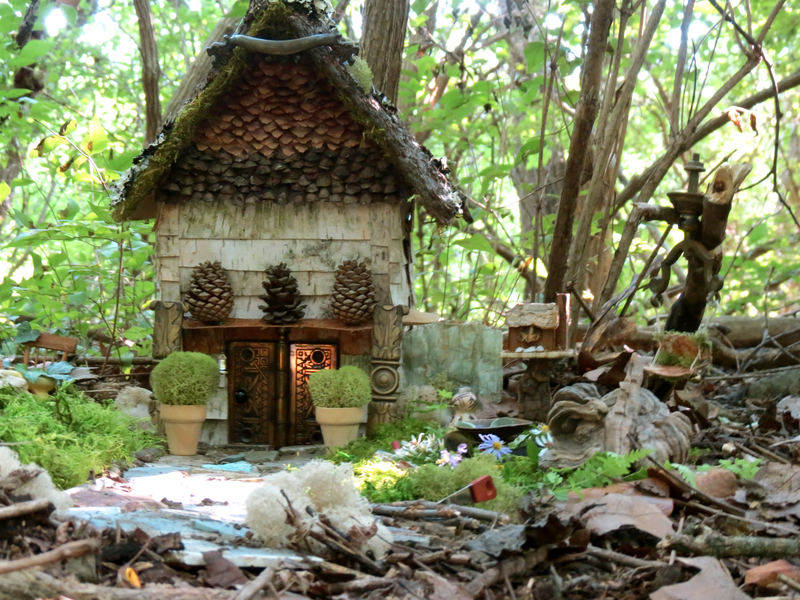 The house was built from cardboard, then covered with the bark, moss, and pine cone parts. It took us a couple days of non-stop work to make the entire set up. 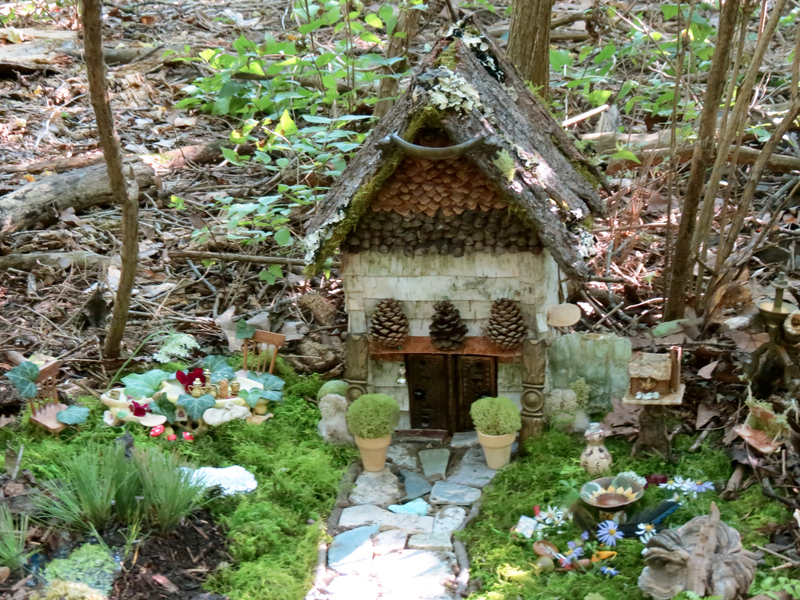 The house stands 15″ tall, 11″ wide and about 11″ deep. 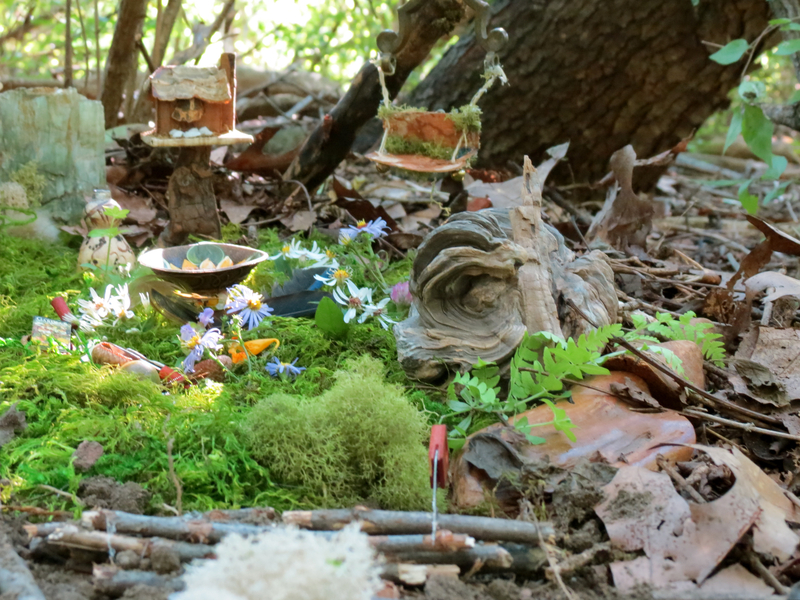 The diorama is about 3 feet by 2 feet and contained everything from a bird bath, small pond, and miniature table with tea cups and flowers (which can be seen in a couple of the shots). The day it was all photographed, we had quite a fight with the weather and sunlight, leaving me disappointed by the quality of the photos. We had carried the entire piece 2 miles out into the woods looking for the “perfect spot” to set up. It was quite the production. The photographs do not do it justice. Hopefully I will be able to take more pictures at some point in the future. (And bring another 2-3 people to help carry the set up someplace more inviting). I want to thank my nephew for his dedication and assistance in this project. He did a great job.